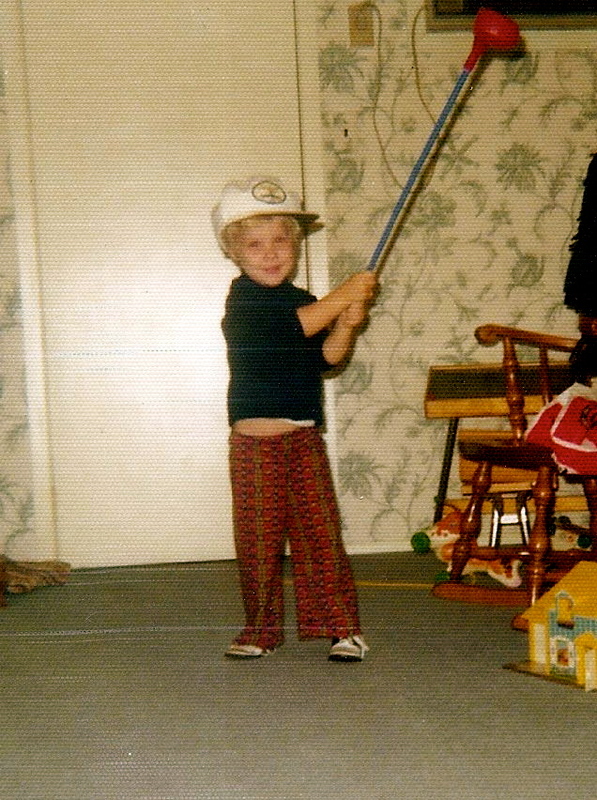 Golfer at four years old. When I was about six, my Dad cut down one of his golf clubs to my size, covering its “new” handle carefully with grip tape. For the next few years, on any random spring or summer evening, he’d find me and say, “Come on, let’s head down to the field.” And off we’d go to Memorial Field: Dad, a bucket of golf balls, a few tees, my club, and me. Though incredibly impatient when trying to help me with math homework, my Dad had never-ending patience when teaching me to hit a golf ball. I, on the other hand, grew impatient quickly, when the ball skittered off my club’s heel or when I skyrocketed a large clump of grassy earth, but not the ball. I remember that I often wanted to give up and go home. And I remember that he never let me. Instead, he’d talk quietly to me, reminding me how to hold my hands, reminding me to keep my head down, to swing in one continuous motion. Every once in a while, I’d hit that damn ball on its sweet spot and off it would sail. A white dot disappearing into summer grass. And just like that, I’d feel like I could swing all day. ← Day 27: Bowl Cuts of the ’70s, Unite! My brother used to try to club me to death with a contraption that resembled that one……. I hope you are going to keep this up once you’re supposed to be done. Hearing from you is fresh air in my day, and it’s doing some great things for your writing. Not that it wasn’t great before. I know you know what I mean. Yipes! Clubbing to death by club! I think we might need to hear that story…Thanks so much for your kind words and encouragement to keep on with this. I so admire your dedication to writing. Thanks always for your support and inspiration, friend! It means more than you know. Love this. Also, I’ve never played golf before, but would like to learn. Do you still have mad skills? Actually, I haven’t played in years. We should definitely hit the driving range…with Anne and whomever. Great stress release!